Speed limit 35 MPH! Sounds too slow. Isn’t it? A Signboard appears in front of you while driving from one location to another. Now you will slow down the speed of your car and will look down at the speedometer. Speedometer one of the most frequently viewed or used tool in the dashboard, which depicts how fast you are going. The dashboard instrument clump in your car includes a variety of sensors, gauges and lightings. Ever visualized if there were no dashboards in car’s containing all the infographics, well it would have been dangerous to drive. The same is true for business users: Dashboards use data visualizations; simplifies complex data sets to provide users with a glance of current performance. Running a business without an Executive dashboard could be dangerous. The main idea of the dashboard is to provide customers and prospective customers a place where they can catch up on news and get a glance overview of what’s happening and what’s hot. The dashboard depicts the speed at which the organization is moving. We are happy to announce the launch of Interview Mocha's Dashboard. Interview Mocha’s simple, faster and clutter free dashboard provides you the bird’s eye view of all the activities and you can dive down into the particular details. Let's have a quick dashboard confessional that covers what each part does. 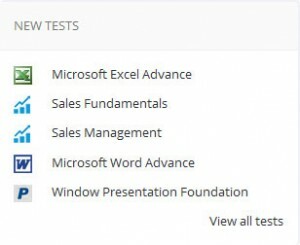 Most popular and new tests section is the test library with the specific test designed to assess candidate's skills and knowledge for a specific job title. 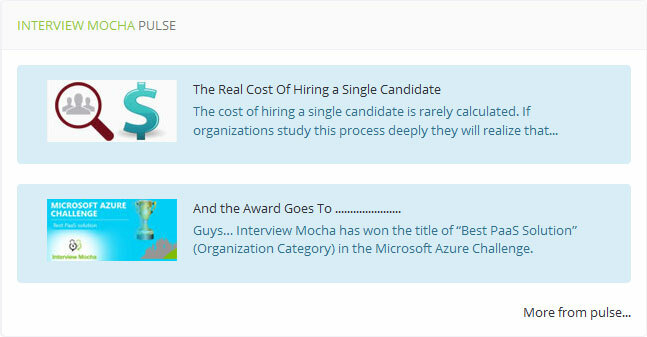 It offers at a glance look at Interview Mocha’s recruitment blogs, posts and media presence. Click the link ‘More from pulse’ and you will be taken to the associated screen where you can view the entire blogs and Interview Mocha in news. We listen to each of our customer carefully and align our product development efforts in line. Stay updated with our new features section that will bring in your own requested feature every now and then. Be assured, what’s in for you – more time saving, efforts saving, cost saving and yes hassle free too. This section of the dashboard provides the statistics of the tests attempted by the candidate. It generates the total usage report. It is said that Power is gained by sharing knowledge, not hoarding it. Now it’s your turn to refer Interview Mocha and guess what, get free tests from interview mocha as an appreciation. Interview Mocha customizes the pre-employment assessment tests according to your requirements and specifications. Features in the product according to you convenience that makes assessment simple and painless. While learning to drive a car, it seems unfamiliar at first but later you develop your habits and steaming your own way. Take few minutes and try clicking around and exploring the new layouts and features in our dashboard. 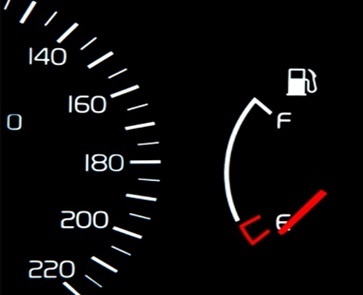 If the needle on the fuel gauge of your car is dropping below the empty line, do catch up Interview Mocha. 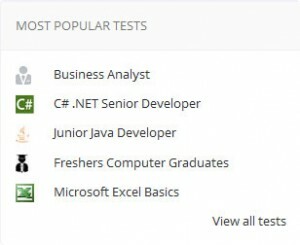 Human Interviews or Written Tests; which one to Choose!